imagine that one day you lost your sight, how would this change how you live and navigate your environment? 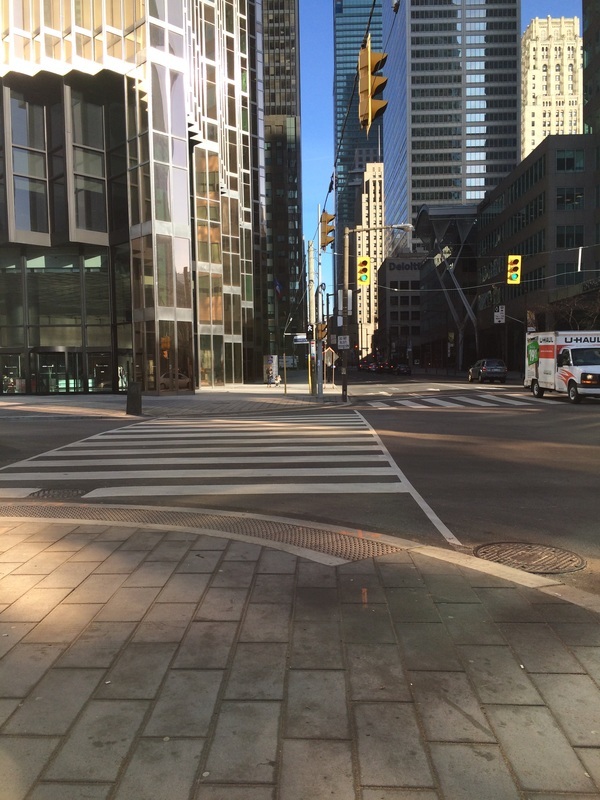 Street corner with clear crossing lines and curb textures in Toronto, Ontario. Seeing the Built Environment from a New Perspective. Picture yourself standing on a city street corner. You are absorbing the sounds of people, traffic and the hum of the unfamiliar city around you. How do you go about navigating this space, understand where you are and how to get where you want to go? Are there signs nearby that clearly indicate the street names, are they close and easy to read, are they consistently located? Are there maps that indicate your location and nearby amenity? Now, imagine that you are one of 50,000 Canadians who experience some form of visual limitation such as complete blindness, or have a visual limitation such as limited field, low vision or limited depth perception. How does this change your experience? What aids do you require to navigate this space independently? There are many types of disabilities, some physical, others mental, and many more that are not obvious. Visual accessibility is only one form of disability and how it relates to urban form can either open or close doors. Navigating modern cities and communities can often be a daunting and intimidating experience whether you travel by car, bike or foot. Visually Accessible Cities is created to share perspectives and convene a conversation on how to build more inclusive and livable cities. Follow our blog posts for insights into opportunities and challenges in designing better cities. Posts reference specific examples or real barriers and solutions that have been used in cities around the world. Contributions of resources, examples and stories of improvements to visual accessibility are welcome and will serve to improve this site. Architect Chris Downey discusses his experience in losing sight as an adult and how designing cities for the blind can result in a better environment for everyone. Image of an area map in Christchurch, New Zealand helps people identify area landmarks with easy to read colours. Walking through the streets of your community you may have at some point sensed that the landscape is designed for the movement of vehicles and not people. Well, the reality is that would be true. Transportation engineers and town planners became experts in the efficient movement of traffic over the last fifty years. They however forgot that cities are for people first. It is only recently that the need to design cities for people is being taken more seriously. An increasing number of people never drive a car, but instead move around by transit, bicycle or foot. These modes of movement need to be better supported. Even drivers at some point exit their vehicles to navigate their city on foot. Changing the urban design of our cities to accommodate improved visual access has benefits to everyone. We must all find our way, whether to our destination or simply to enjoy public space. This project captures some of the innovations in design that are providing better visual access and mobility in our urban environments. Technology and physical design can go hand-in-hand to improve accessibility. The rapid adoption of smart phones, tablets and other mobile devices with real time access to cellular data and location services can provide those with low vision with other means to sense their environment. Mobile technology with integrated accessibility functions such as magnification and voice dictation have also put into the pockets of people with low vision a suite of tools that may not have been available previously, or combine several stand-alone tools such as binoculars and dictation devices into one pocket-size support. 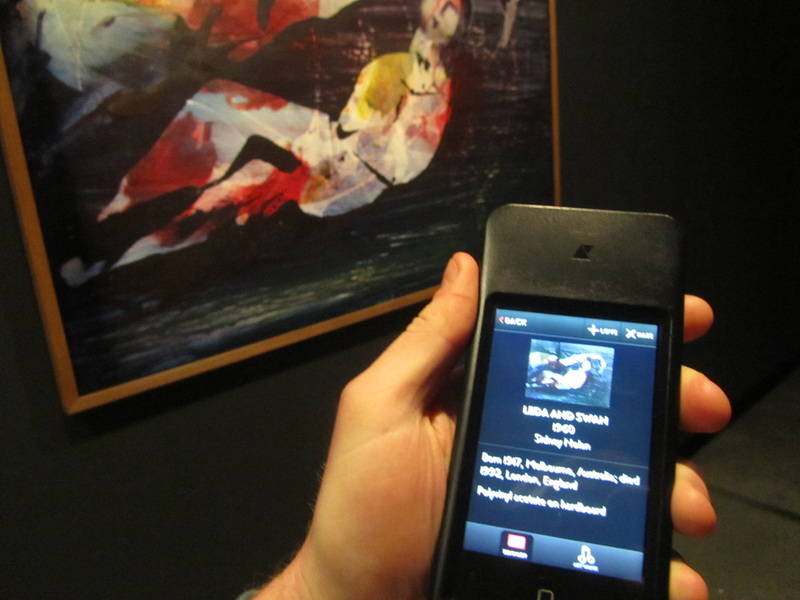 A tablet is pre-loaded with audio about exhibits in a museum according to numbers located on the floor.